I wouldn’t ordinarily have been chomping at the bit to see this particular movie, but had the opportunity to see a free advanced screening, and figured I may as well take advantage of that. 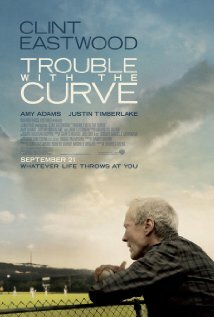 Trouble With The Curve is yet another among the throng of baseball movies made over the years…so at this point, to keep it “fresh”, something different or at least entertaining must be done if another inning is being added to what can already be a slow game. Unfortunately, this addition is as trite and stale as they come. Trouble is literally riddled with clichés from start to finish, from the characters to the story to the shots and everything in between. 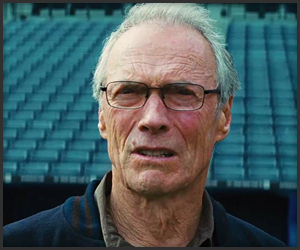 Clint Eastwood (with his trademark Clint Squint) plays the irascible ~ and entirely unsympathetic ~ Gus, an aging baseball scout for the Atlanta Braves with three months left on his contract, who, between his deteriorating eyesight and his stubborn unwillingness to embrace technology of any sort, should be retired. He has a strained relationship with his attorney daughter Mickey (predictably named after Mickey Mantle), played by the always winning Amy Adams. He shows little love or affection to her or anyone, for that matter, softening only during a “conversation” he has with his late wife’s headstone at the cemetery, in a scene so on-the-nose it is shocking, not to mention painful. In it he tearfully recites the ditty “You Are My Sunshine” in its entirety, only to be followed by the song actually playing over the scene. Really?! Sadly, that is only one example of the many obviously transparent moments throughout the film. All too often we hear a character “thinking out loud”, as if we, the audience, aren’t perceptive enough to figure out what they may be thinking by ourselves. It leaves nothing to the imagination, nothing of interest, nothing to surmise on our own, which is not much fun…not that there’s anything of much substance here to begin with. Initially, I assumed I shouldn’t have expected more from the man who made an utter fool of himself (and his party) by nonsensically talking to an empty chair (intended to be an invisible President Obama) at the Repu blican National Convention in Tampa earlier this month. However, in his defense, I realized he didn’t actually direct this film, but rather gave his long-time assistant director, Robert Lorenz, his first shot at the helm, as well as a first-time writer, Randy Brown, the chance to tackle the screenplay. While I can appreciate his giving both of them the opportunity, the film comes across as decidedly amateurish across the board, from script to screen. 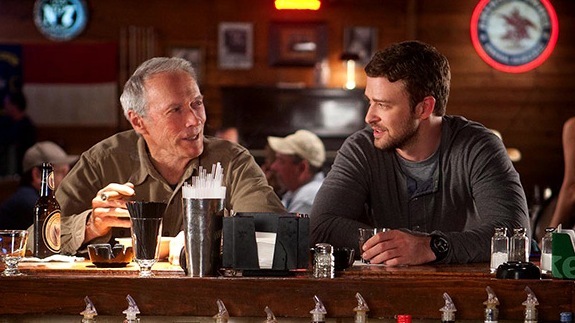 Clint may not be cut out to speak publicly on politics, but the man has been known to direct with great success (Unforgiven, Million Dollar Baby), so you’d think he could have given a little more guidance considering the film was made under his production banner. The troubled father/daughter relationship is, in my opinion, never satisfactorily resolved. In fact, after endless attempts by Mickey to get him to open up, Gus’ eventual “explanation” for abandoning his daughter when she was young comes completely out of left field (pun intended), feels misplaced and weightless, and is therefore undoubtedly a foul ball. With a pitch this weak, anyone would have trouble with the curve. So if it’s a baseball movie you are craving, rewatch Bull Durham for the clever fun of it, or Robert Redford in the The Natural for the inspiration of it, or see the whip-smart, snappy and brilliantly-acted Aaron Sorkin-penned Moneyball (one of my favorite films of last year), because Trouble With the Curve isn’t worth the price of a bag of peanuts or a Fenway Frank. This entry was posted in Movies and tagged Aaron Sorkin, Amy Adams, Atlanta Braves, Baseball Movies, Boston Red Sox, Bull Durham, Clint Eastwood, entertainment, John Goodman, Justin Timberlake, Mickey Mantle, Moneyball, Republican National Convention, Robert Redford, The Natural by Missy Krehbiel. Bookmark the permalink.